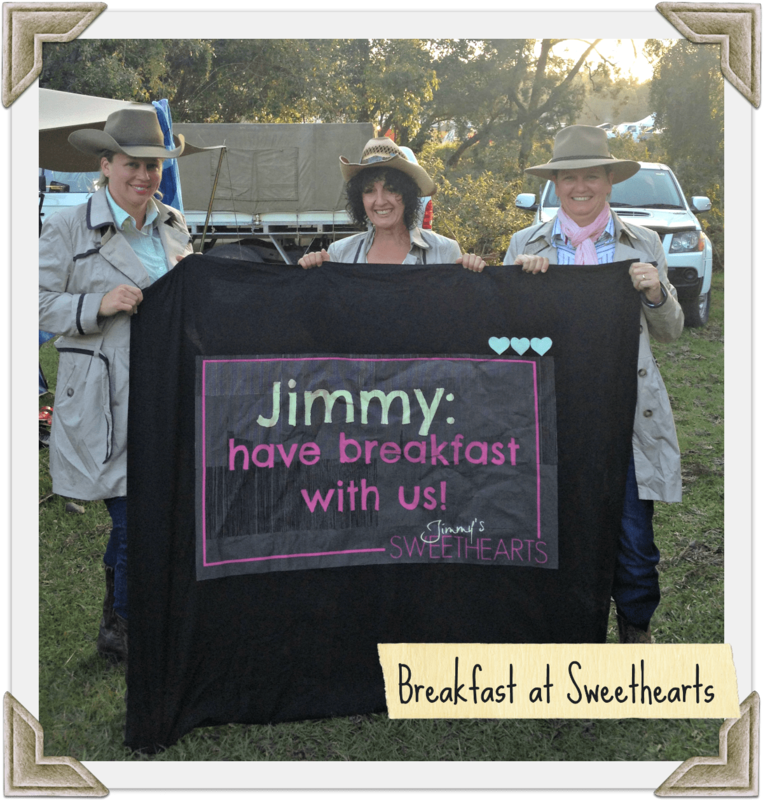 If you subscribe to the newsletter, you’ll know that we headed to the Gympie Muster last weekend. If you don’t subscribe to the newsletter, you should. click here. The Muster is a cracking weekend filled with good fun and great music and it attracts people from all over the country. On Thursday night my girlfriends and I had the pleasure of making the acquaintance of some fellows from country Victoria. It’s testament of our advancing age (and likely our marital status) that instead of high jinks this meeting lead to an invitation to morning tea. The camp cook was a bloke called Mark Barton. He’s a former bull rider, forced into retirement after a motorbike accident. Luckily he has his culinary skills to fall back on. He’s agreed I can share his recipe with you. Measure the flour into a large bowl. Add the cream and lemonade and mix to form a soft dough. Turn out onto a lightly floured bench and knead lightly until combined. Press the dough with your hands to a thickness of about 2cm. Use a round cutter to cut out the scones, place on baking tray making sure that the scones are touching – so they can support each other as they rise. Bake for 10-15 minutes until lightly browned. Serve warm with your favourite jam. 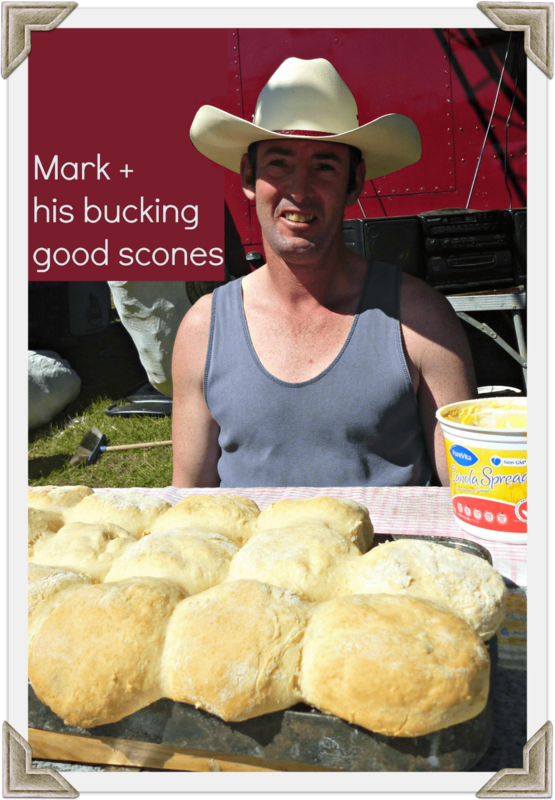 Barto’s scones were light and lovely and formed the perfect basis from which to prepare for a lively session heel and toe that afternoon. The other beauty about this recipe is it’s simple to remember, which is especially important when you’re swapping recipes late at night after a few jars. Given that Mark had been so hospitable, we thought we’d best extend the same kindness to Jimmy Barnes and invite him to breakfast. He didn’t accept our invitation, but he did give us the thumbs up. Here’s a sanitised sample of what went on last weekend. There’s a moral to this story kids. You can come off a bull a bunch of times, but there’s no second chances if you get bucked off a bike. Best you learn to cook! have you been to the Muster? what’s the strangest invitation you’ve ever received? I’ve got that scone recipe!!! That is my go to recipe and it NEVER fails me! Muster looks like a ton of fun! Style lemonade that contains lemons? 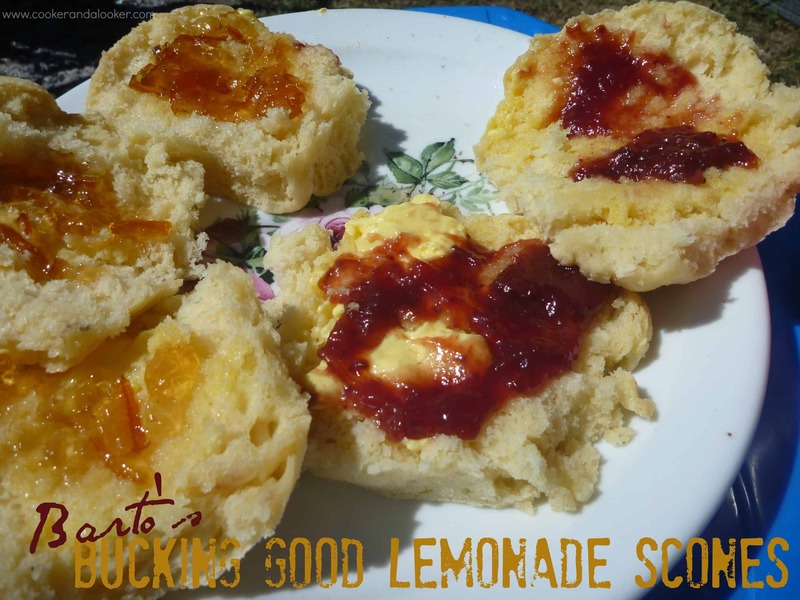 A friend of mine used to swear by lemonade scones – thanks for the recipe. Hello duckie, I have never yet made lemonade scones – how daft! This is a simply simple recipe – noted! the Muster looked like such a laugh… one day. These were my first lemonade scones too Sonia, but they won’t be my last! Love really simple recipes – they’re perfect for baking with the kids. Goodness I have to try these scones tomorrow. Why have I never made lemonade ones before? They’re too easy aren’t they?